As the first all-girls school in Massachusetts, established in 1853, Notre Dame Academy continues to deliver a unique student experience. It has a rich heritage focused on the simple goal of developing young women of faith, character and scholarship through a dynamic college preparatory environment. The mandate of its founders, the Sisters of Notre Dame de Namur, “to educate women and equip students with whatever is necessary for life” is evident today on the Hingham campus, home to over 435 students in grades 7-12. Students come from more than 30 communities across Massachusetts and several countries around the world. NDA hosts students from China annually and welcomes students from Germany, Spain, Switzerland, and the United Kingdom. The student/teacher ratio is 12:1. 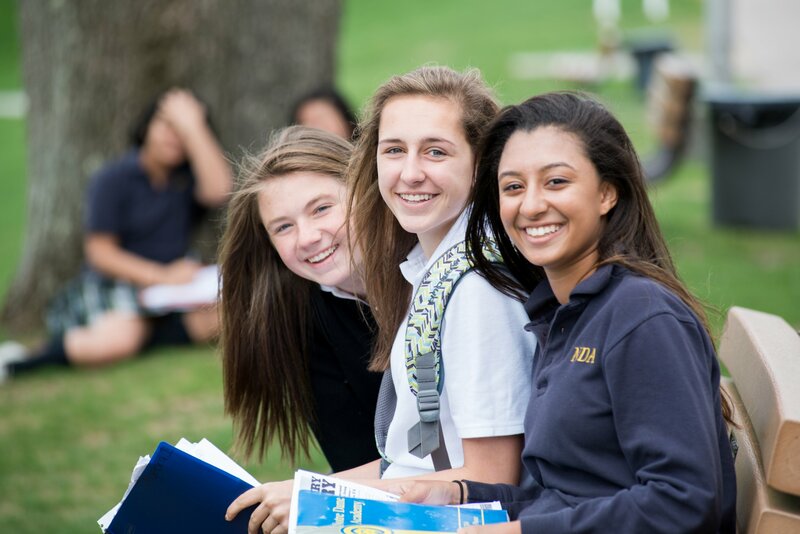 NDA provides a rigorous curriculum with offerings in both AP and IB, as well as honors and college-preparatory options. The International Baccalaureate Diploma Programme at NDA fosters risk-taking, nurtures curiosity and establishes an openness to the values and traditions of others. The IB Learner Profile is a curricular component that is ideal for the all-girls setting in that it pushes girls to see success as approaching challenges through trial and error, making them more confident and self-assured. The IB Diploma Programme's holistic, student-centered approach is a powerful force for developing confident NDA women. It requires students to embrace the world beyond their community and their borders, encouraging social responsibility on behalf of global justice, a key attribute of the school's mission. The Academy's philosophy of developing the whole student is not only apparent in the classroom but is also a hallmark of the athletic program. A community that stresses character above winning at any cost defines NDA athletics. It is a highly successful and regionally recognized program, a key part of over 80% of the student body's experience. A staff of over 50 coaches supervise interscholastic teams in 18 sports and 35 levels. NDA is proud of recent achievements on the field, ice, track, court and course including 33 state championships, multiple league and conference titles and Coach of the Year awards; but, NDA is most proud of winning the Neil Singelais Award 27 of the past 30 years which is presented to the all-girls school that has amassed the highest winning percentage and exhibited the most admirable sportsmanship. Just as the academic mindset extends beyond Greater Boston, student life at NDA extends far beyond the classroom. From co-curricular clubs and athletics to campus ministry opportunities and the arts, young women are inspired to create new experiences and explore their passions. Each afternoon, NDA students take part in a wide variety of co-curricular activities. Students find themselves discussing global issues, designing computer code, or using their artistic talents on the stage or in the art studio. NDA aims to empower students to become bold, creative and thoughtful artists. In Visual Arts, students create work that challenges them to explore and problem-solve. Music students showcase their talents to the entire school community through concerts and musicals. Thespians at NDA perform in fully-staged productions. In addition to opportunities academic, athletic, artistic and co-curricular, an integral part of the Notre Dame Academy experience is service to others. Students travel as far as Tanzania and Costa Rica or as near as the South Shore to give back. The Academy believes that reflecting upon service is a life skill. Students are encouraged to examine their choices and decisions in the light of their faith and consider their influence on the global community. Faculty and staff believe unequivocally in the gifts and talents of every student. It is their goal to help the young girls who pass through the school's doors graduate as confident and compassionate women of impact who are ready to impress the world. Notre Dame Academy is accredited by the New England Association of Schools and Colleges.